A recent article by Andy Coghlan on newscientist.com - Extinct Neanderthals still control expression of human genes - reports on latest research which claims that Neanderthals are still affecting what illnesses some people develop, how tall they are and how their immune systems work, despite being extinct for 40,000 years. A study, based on the Neanderthal DNA of non-African descent inherited from ancestors who mated with our cousins some 50,000 years ago, has revealed how this genetic legacy is still controlling how some people's genes work, with possible consequences for their health. Neanderthal influence has waned fastest in parts of the body that evolved most rapidly around that time, especially the brain. It suggests that once our direct human ancestors had evolved the equipment for sophisticated language and problem-solving, mating with Neanderthals - and the DNA that came with it - rapidly fell out of fashion. 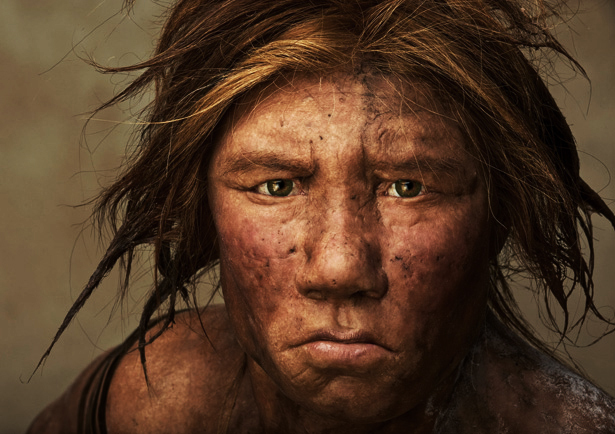 However, Neanderthal influence of human genes endures, some of it positive and some negative. The study, led by Joshua Akey at the University of Washington in Seattle, is based on analysis of DNA from 214 people in the USA, focusing on individuals of European ancestry. By comparing their modern DNA with that from Neanderthals - whose genome was sequenced in 2008 - the team was able to identify which Neanderthal gene fragments had survived and were still active in 52 different types of human tissue. Results showed that some people had one human and one Neanderthal copy of the same gene. When comparing these genes, a quarter showed differences in activity between the modern and Neanderthal versions of the same gene. More importantly, the researchers could tell which variant had the upper hand. For example, Neanderthals may still be protecting some people from developing schizophrenia, as well as making them taller. A gene called ADAMTSL3 is a known risk factor for schizophrenia, but the way the gene is controlled by surviving Neanderthal DNA reduces risk and increases height. Essentially, Neanderthal sequences present in living individuals are not silent remnants of hybridisation that occurred over 50,000 years ago. Instead they have ongoing, widespread and measurable impacts on gene activity. Conversely, receding influences were detected in the brain and the testes. Neanderthal control waned most in the cerebellum and the basal ganglia, brain regions vital for fine motor control and perception, that evolved further in humans to encompass advanced thinking, including language processing and behaviour. The differences in the testes reflects sexual incompatibility of the species. One of the testes genes over which Neanderthal DNA lost control affects the formation of a sperm's tail and, subsequently, its ability to penetrate and fertilise an egg.